The new brake discs are made from cast iron with an exceptionally high carbon content, delivering benefits such as greater temperature resistance and improved damping behaviour, which in turn helps to reduce the level of brake noise. Thanks to better thermal conductivity, braking performance remains high and fading remains low – even in extreme situations or during sporty driving. “Brake discs are having to meet ever-stricter specifications, which requires a strong design but first and foremost impeccable quality materials. By expanding our range of high-carbon brake discs we are able to respond even better to these requirements,” explains Patrick Baßiere, Product Category Manager at TMD Friction. He adds that manufacturers are fitting more and more vehicles with high-carbon brake discs as standard, meaning the spare parts market is able to benefit from TMD Friction’s wide vehicle coverage. He goes on to say that the “PRO+” brake discs offer numerous benefits: an high end look to complement alloy wheels and above all greatly improved braking performance. The high carbon content of the brake discs keeps them cooler while driving. They perform better in NVH tests, meaning they’re less susceptible to judder and screeching. The optimised surface coating also provides an effective barrier against corrosion. What’s more, there’s no need to remove the protective oil – the brake discs can be fitted straight away. They will also be supplied with clamping bolts in future, meaning the Textar “PRO+” brake discs will deliver greater efficiency thanks to faster brake disc changes. 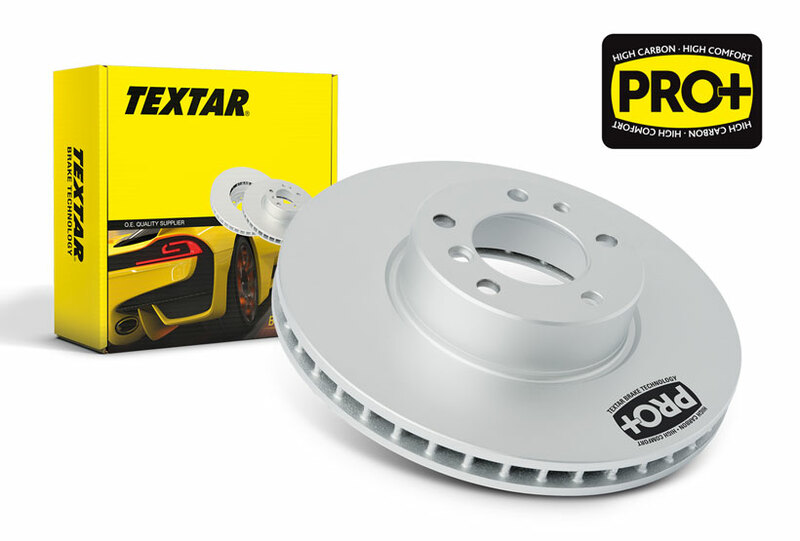 Caption: Optimised braking performance, reduced brake noise with “PRO+”: Textar is expanding its product portfolio of high-carbon brake discs. Photo: Copyright TMD Friction, 2016. Free reprinting permitted provided the source is quoted. Please send us a specimen copy.